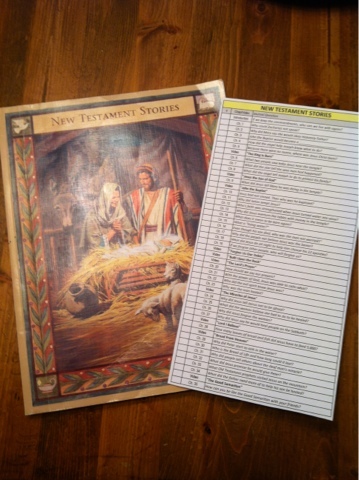 I made my 7-year-old a new bookmark schedule for her study of the LDS New Testament Stories. She finished the Book of Mormon Scripture Stories reader, so it's time to move on. Because the stories are narrated on DVD, I decided to let her listen and read along with each story on my iPhone. Since this is her personal scripture study, I knew if she heard the narration, she would also learn how to correctly pronounce words she was unfamiliar with. Obviously if you have a younger child, you could read to them, but I really want her to become an independent reader. She still has room in her last journal to answer the questions on the bookmark. Each one correlates with a chapter of the LDS New Testament Scripture Stories. And there is a check-off square next to the chapter or video when she completes it. 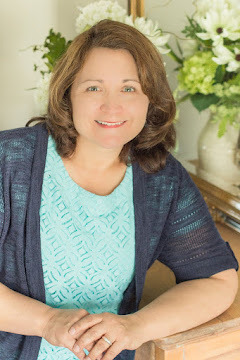 I say video because I added the New Testament Living Scripture videos to the schedule as well. So she can read, see, and write about the New Testament. I didn't add additional scriptures for her to look up this time, because there were so many videos she could watch. This new generation of children has modern technologies which can assist them in their study of the Gospel. When my daughter was studying the Book of Mormon, we also watched "The Testaments: Of One Fold and One Shepherd" together and it was a wonderful experience. I adapted this idea from a post at Latter-day Homeschooling. Even if you don't home-school, this website is a great resource. You may also be interested in the Book of Mormon Stories Study chart. Sorry, but these are the only ones I made. My daughter is now studying from Discover the Scriptures products. 2013 Preparedness Goal: Immerse children in the scriptures. and great shall be the peace of thy children." I love this idea! My stake president has really focused on the value of scripture journals and the power they can bring to our lives. My kids don't write or draw well enough to keep a journal, but I think I can still adapt it for them. I used your Book of Mormon study with my girls, 9 and 7 last fall. We started the New Testament scripture journal in January. My 7 year old read ahead so that she could read about Jesus resurrection on Easter morning. She was so excited. I just wanted to let you know how helpful these posts on kids scripture reading have been for our family. (My older daughter is just a little behind her sister, and is working to catch up!) My seven year olds reading had definitely improved. Struggled last fall, and we would alternate reading paragraphs. The pictures in the readers helped keep her interest. Now she reads me the stories all by her self. Yes, Colleen. I will make the Old Testament study bookmark. I love to read my daughter's journal. So cute. :-) I can't believe I forgot it. I must have been up late working on that. I just added it. Thanks! I just found this idea on Pinterest and I love it! :) so I've been looking around your site (and found many other great posts, thank you!) but I only found The Book of Mormon printable. Did you ever make schedules for the other books? Hi Kimberly, sorry it's taken me so long to respond. I just update the Book of Mormon printable and the New Testament printable in pdf and Excel. This Book of Mormon and New Testament bookmarks are awesome!!! Thank you. Will you be making one for the Old testiment also? Thanks. No I won't be making one for Old Testament. My daughter is older now.